Ideal for running bottles or containers on the conveyor line. Typical filling ranges are from 1 gram to 10 LBS. The Fill Head can also be mounted over a Twin Lane Form Fill Seal Machine. The Image 3800 is a twin head auger filler than can have centers from 9”-20”. Closer centers will require a fabricated fill head. 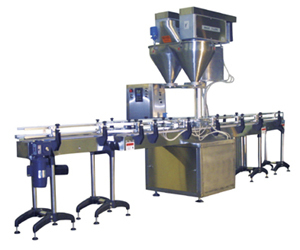 The conveyor system has one infeed conveyor that splits into 2 lanes. The containers get filled (2) at a time with no empty containers going through to a second fill station. This is a true “double your production” filler. 36”, 48”, and 60” diameter unscrambling and accumulation tables.